Harley has found what we all wish for – a genie in a bottle, able to grant us our unlimited wishes. However, like many stories of this type, not every wish goes the way it’s intended. For instance, never request a hot dog from someone whose only point of reference is a canine that is overly warm. Granted, Harley tries not to be self-serving, willing to share the wishes in such a way that others might benefit. Nor is it all mischief-making on her part – though Diana’s reaction to a pantless GL is priceless. And yes, there are guest-stars, such as the JLA and Power Girl. Not that this a bad story – I just don’t understand why it was presented in this format. 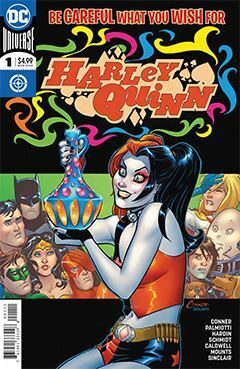 It easily could have been presented more effectively within the pages of the mainstream Harley title. But the art is spot-on perfect, with Conner & Co. getting help from Chad Hardin, Otto Schmidt and Ben Caldwell. One might expect it to be a bit jarring, to have multiple art styles, but their placement within the wish sequences makes it work.